In the process of developing a robust supply network across the globe, enterprises unwittingly leave behind a deep carbon footprint. Even companies that have gained some visibility to their supply chain and potential impacts are not always sure what to do next. A recent study published by CDP and Accenture (CDP & Accenture, 2014-15) reveals that policy guidance in the United States has helped equip only 50% of North American suppliers with climate risk management strategies for dealing with carbon emissions and other ecological challenges. This puts the country in the most vulnerable quadrant for climate-related risk mitigation. The good news is that a meaningful reduction in the carbon footprint of our global supply manufacturing and distribution/logistics networks is achievable and best practices are emerging. Green supply chain management (GSCM) is a proven set of strategies to control environmental impacts and risks to your global supply chain manufacturing and distribution processes. 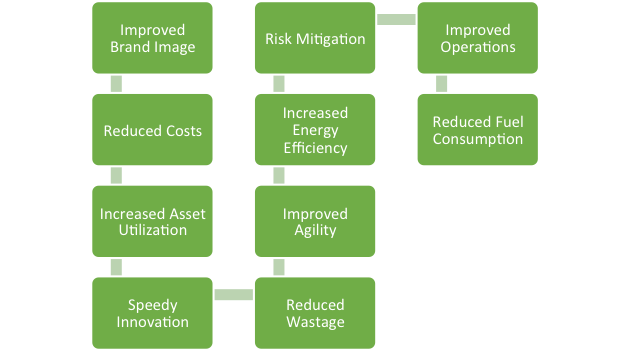 The benefits to business from developing a green and sustainable multi-enterprise supply network via GSCM techniques are numerous and compelling. They range from improved brand image, to reduced costs, to reduced operational risks. Commitment is the key first step towards green operations. Gain executive commitment and sponsorship to visibly support program goals, strategies, and execution plans. Identify an accountable program champion. Define metrics and benchmark environmental impact in areas like waste generation, energy consumption, emissions, etc. Set targets and devise policies that offer guidance on how to achieve targets at every level of the enterprise and across the product life cycle. Ensure policy compliance goal/target achievement across the extended enterprise leveraging executive support. Develop a green corporate culture by offering training and workshops to employees and stake holders, as well as incentives and recognition. Consider acquiring green certifications and performing green audits. Map your supply chain end-to-end to gain visibility to your multi-tier supplier network and sub-tier suppliers. It is impossible to implement GSCM strategies if you are not sure what your network looks like and who your suppliers are beyond your tier 1 partners. Consider using a third-party supplier onboarding/network mapping service to reduce the cost of implementation and ongoing updates. Monitor supply network for environment-related news such as chemical spills and environmental compliance breaches leveraging third-party 24/7 event monitoring and analysis services. Procure materials/parts from suppliers who adhere to green principals and processes (e.g. lean manufacturing) and have a strong green policy and standards. Deal with suppliers who acquire ISP14000, OHSAS18000, RoHS directives and behest stringent norms to control hazardous substances. Ensure that the material being purchased is non-toxic and recyclable. Perform quality checks at material inflow points. Implement inventory control strategies selectively to reduce stock and eliminate warehousing costs. Incorporate manufacturing process(es) that curb or control pollution/wastage. Design and redesign products to minimize production complexity, reduce energy consumption, and increase the product life span. Use non-toxic, lead-free materials for manufacturing. Studies have shown that we only add value in 5% of time spent on operational activities, the remaining 95% is waste (Lean Manufacturing Tools, n.d.). Green distribution consists of green packaging and green logistics. Downsize packaging to reduce material consumption. Use recyclable, reusable, non-toxic, and bio-degradable packaging material. Design warehouses to reduce energy consumption. Hire vehicles designed to control for carbon emissions. Plan the transportation route to reduce mileage. Plan reverse logistics to collect used products and packaging from customers to recycle/reuse. “People 'over-produce' pollution because they are not paying for the costs of dealing with it” (Chang). Invest in green supply chain management as a step towards mitigating environment related risks. CDP & Accenture. (2014-15). Supply Chain Sustainability Revealed. CDP. Chang, H. J. (n.d.). 23 Things they don't tell you about Capitalism. Thoo Ai Chin, H. H. (2015). Green Supply Chain Management, Environmental Collaboration and. ScienceDirect. United States Environment Proctection Agency. (n.d.).